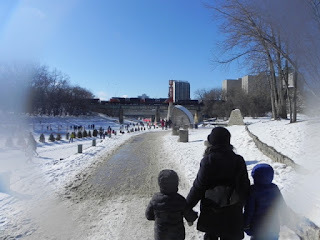 Last Sunday, we took advantage of some fabulous warmer weather (we've had highs in the 20 to 30F range, or for folks in Celsius, highs around -5 to 0C) lately. I'm still really lacking stamina from the pneumonia, and one of my kids got knocked out by a big hives episode last Saturday, so we're doing things slowly. 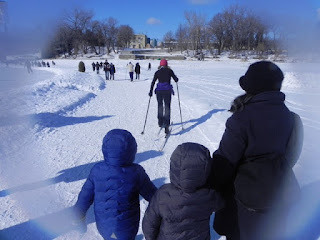 We have been very sorry to miss the skating season--but we took the River Trail's walking trail and went out on the river. For those who don't know what this is, every year, our two rivers freeze solid in Winnipeg. 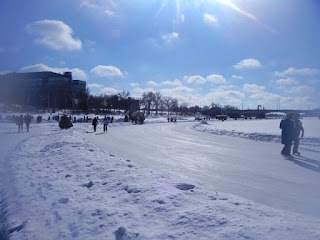 There is an amazing effort to create kilometers of skating and walking trails on the river. We have an international competition to build architecturally interesting warming huts. Folks commute, walk their dogs, (or skate their dogs), drag their kids in sleds, and spend time outside every winter. This year has been a special event: 10 kilometers of groomed river trail AND, as of yesterday, 69 days open to skaters and walkers--a new record. The trail is weather dependent. Some years,it opens late, the ice is too bumpy, or it just cannot be made longer. This year, we hit the jackpot and I was just yearning to see it...although even this one extended outdoor outing was still pretty hard for me. The weather was perfect and everyone we saw seemed to be grinning with enjoyment. One joke that ran on the river trails "conditions" twitter feed was something like: Our Canadian Olympic speed skating champion, Ted-Jan Bloemen can do 10 k in 12 minutes. How fast can you do the winter trail? We did only a fraction of the trail, bumped into some friends, saw a few warming huts, petted some amazing dogs, (one husky weighed 170 pounds!) and nearly got run over by three cross-country skiers. On the way towards home, we stopped to see the Nepinaks. 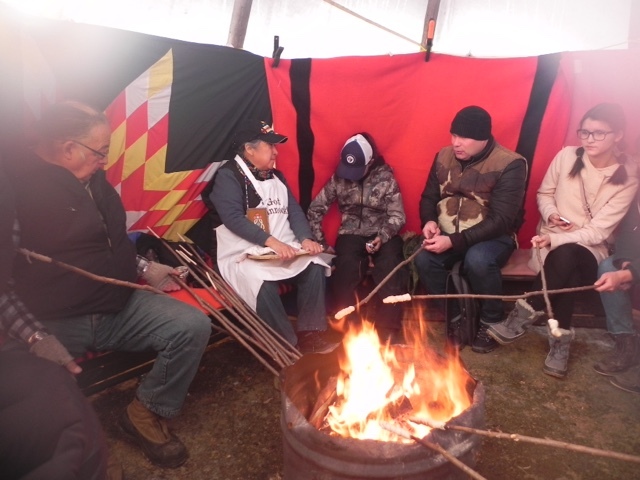 These elders offer their time every year to invite people into a warm teepee at the Forks to cook bannock and talk. We cooked bannock together on whittled sticks and thoroughly enjoyed ourselves. This was a highlight of the day for me - a beautiful way to make connection and break bread and acknowledge that we are on Treaty 1 land. We topped it off with some ice cream on the way out and headed home. I paid for all this by being absolutely worn out from the physical effort--definitely still not 100% yet, but it was well-worth it. I hope you enjoyed reading about our adventure!